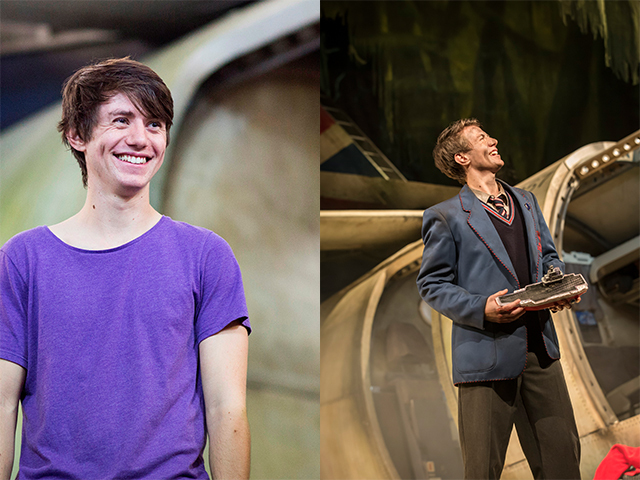 Luke Ward-Wilkinson in rehearsals, and on stage, in Lord of the Flies. Heading back from Newcastle to London for the final week of the tour was strange and felt nostalgic. Passing by familiar cities, and even ones not quite on the route: Edinburgh, Salford, Liverpool, Birmingham and Leicester, evoked a sentimental feeling deep within myself. The excitement of performing in a different theatre, in a new city, every week has never faltered. As the weeks zipped by, the sense of community I found with the other guys grew into something I could never have imagined. From the first week, where we all piled into the rehearsal room eager yet slightly tentative of each other, to feeling like we now belong to a something bigger, is something I will never forget. The trust I have found in the other guys on this tour, the friendships I have made, and the experience of performing in some of the most beautiful theatres in the UK and Republic of Ireland, still kind of takes my breath away. It’s quite strange to think of how many interviews and live radio broadcasts I have done over the past 8 months; BBC Manchester, Mersyside, Leicester, Leeds, Sheffield and Cambridge, and plenty of telephone interviews for newspapers and magazines across the country. I never knew how much fun you could have doing the press side of things, and Freddie (Jack) has been awesome when we’ve sat in the many studios together talking about the show. We’ve also done lots of post- and pre-show talks with audience members, which has been something I’ve never experienced before. Last week I sat with Anthony Roberts (Piggy) in the auditorium of the Theatre Royal, Newcastle talking with a lovely group of elderly guests who had seen the show. Anthony is a lovely person, and his sense of humour had the group in hysterics when explaining some of the small mishaps of live theatre. The response we have had after each performance has made me feel extremely proud of this show. Lord of the Flies is still studied around the country by tens of thousands of children in school, and it has been so good to see the younger generation utterly captivated by the show; it fills me with joy to see so many young kids excited to see and experience live theatre. There has been a real range of audiences; from the matinees packed out with kids studying the book, to the older generations who watch and listen intently to every thing happening on stage. It’s great to see just how many people this book, and play, has had an effect on. The first feeling of nostalgia hit me in Leicester, when we were all saying our good byes for a week’s rest before finishing the last leg of the tour. It was utterly bizarre; I’ve had to say good bye to many good friends and colleagues in past jobs I have worked on, but this was unlike anything I have experienced before. When you travel, live, and work with people, the connections you make feel unbreakable. Seeing all the guys head off to their homes gave me a sense of what it would be like when it’s all over; it filled me with a huge urge to use the rest wisely, and launch myself back into the last leg of the tour on full throttle. There have been ups and downs on this tour, but these have all been purely physical; we’ve had our fare share or niggles and aches! When a spear came down on my foot near the end of one of the shows in Richmond, putting me out for over a week, the feeling of restlessness made me so eager to get back on stage. I genuinely felt I was letting the directors and guys down by not being there, despite only being able to hobble around like an invalid! The genuine response I got from the guys when I came back ready to do the show again, the support, the smiles, the pats on my back when I did the fight call with Freddie Watkins again, almost made me cry. I knew even before that moment, that we had become one huge family, and the support that we have given each other on, and off the stage, was something that held us together. I would like to take my hat off to each and every person involved in this production; the directors Timothy Sheader and Liam Steel, Fiona Dunn, Fight Captain (or as we prefer) Warrior Captain, Jonathan Holby, the techies and production crew, the drivers who have transported the huge set around the country, the managers, the technical stage hands, and the press officers of all the theatres we have worked in who have welcomed us to each venue, and of course to each and every cast member of this immense play. I never would have believed as a fifteen year old boy writing my final English GCSE on Lord of the Flies that I would one day portray that confident, endearing Ralph that I so much looked up to, and be a part of bringing this timeless book to life on some of the greatest stages in the UK. It’s incredibly sad to see it end, but I know this is just a new beginning of another adventure. The intelligence and sensitivity of a great actor. Congratulations Luke! I saw the matinee in Bromley today and was blown away (again!) by the amazing acting of everyone involved and the portrayal of this story. I’ve seen the show 4 times on the tour and you have all never failed to maintain the energy and power to convey this story with the intensity it needs to have such an impact on the audience. I managed to say hello to Keenan, Freddie and one of the twins – sorry wasn’t sure which one! – but the whole cast, crew and team behind this show should be congratulated on such a superb production which merits recognition and awards which it has sadly not received. It’s a shame this wasn’t filmed for a DVD release that could be shown in schools as I am sure many of the young people in the audiences that I saw would appreciate seeing it again and it would be good for schools to show this as part of their curriculum. It’s not fair to single out any one actor from this show as each put so much in to their own performances and I’m sure you all grew and gained so much across the run, so all I can say is Well Done. I’m sure you will all be sad when it comes to an end, as I will too as I could come and watch it all over again! Good luck to you all and I hope you manage to further your careers with more successful roles in the future.